Baseball Blueprint is an easy-to-use mobile app that will simplify your coaching job, eliminate stress, and help you achieve more success on the court. Inside, you’ll discover more than 154 championship proven drills and plays, along with innovative tools to plan your practices and create your own custom playbook. Visit our features page for more details. Baseball Blueprint is designed for use on iPhone or iPad, and all Android smartphones and tablets. Easy-peasy. If you're on your mobile device, just tap one of the buttons below and our App Store page will open up right on your screen. If you're on a PC or Mac computer, click the link below. Follow the prompts to open our App Store page inside iTunes or Google Play. From the App Store page, just press the GET or INSTALL button to install. No problem. If you're an iOS user, just open up the App Store using your iPhone or iPad and search for Baseball Blueprint. Select the app from the search results, then tap the FREE button to install. Or, if you're an Android user, just visit our page on the Google Play store. Yes! The free version of Baseball Blueprint gives you instant access to more than 40 championship proven drills and strategies. 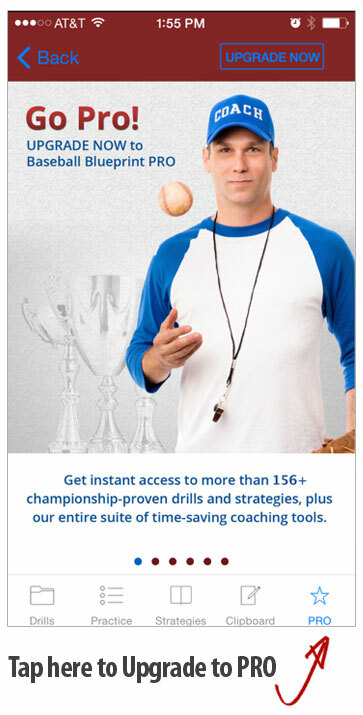 Additional drill packs, playbooks, and coaching tools can be unlocked for a small fee. 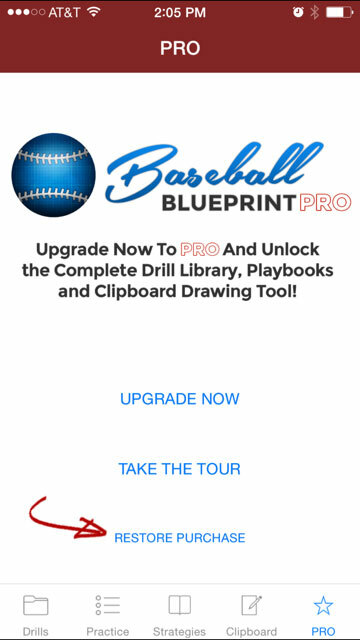 Upgrading to Baseball Blueprint PRO unlocks all drill packs and strategy packs, along with the complete Practice Builder and Clipboard Tool. Yes! Any in-app purchase you make can be downloaded to multiple devices on the same operating system and account. So if you purchase on iPhone, you can also access your material on iPad with the same Apple ID. Or if you purchase on an Android phone, you can also access your material on an Android tablet with the same Google Play account.